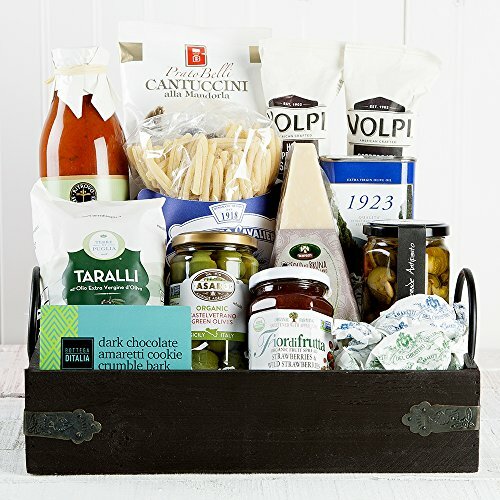 Explore regional Italian classics with our Tour of Italy Gift Basket. In this 13 piece set, take a culinary tour of Italy's finest foods, from antipasti to pasta. Experience Tuscany's extra virgin olive oil and artisan crafted pasta, Parmigiano Reggiano from Emilia-Romagna, Sicilian green castelvetrano olives and much more! An ideal way to introduce someone you love to Italian cuisine. An ideal way to introduce someone you love to Italian cuisine. In this 13 piece set, take a culinary tour of Italy's finest foods, from antipasti to pasta. Experience Tuscany's extra virgin olive oil and artisan crafted pasta, Parmigiano Reggiano from Emilia-Romagna, Sicilian green castelvetrano olives and much more!